Senate and House Republicans are set to introduce a joint bill Friday that would significantly limit the amount of ammunition that federal agencies are permitted to purchase and stockpile over the next six months. The bill, authored by Sen. Jim Inhofe (R., Okla.) and Rep. Frank Lucas (R., Okla.), comes as numerous lawmakers across Capitol Hill have expressed concern that certain federal agencies, such as the Department of Homeland Security (DHS), are stockpiling high quantities of ammunition. DHS, for instance, has placed two-years worth of ammunition, or nearly 247 million rounds, in its inventory. Inhofe said these agencies must provide greater "transparency and accountability" over its ammo stockpiles so that the public can learn about its precise use. "President Obama has been adamant about curbing law-abiding Americans’ access and opportunities to exercise their Second Amendment rights," Inhofe said in a statement provided to the Washington Free Beacon. "One way the Obama administration is able to do this is by limiting what’s available in the market with federal agencies purchasing unnecessary stockpiles of ammunition." 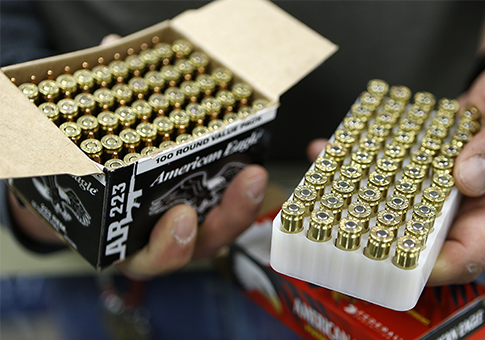 Dubbed the "Ammunition Management for More Obtainability Act," or AMMO, the legislation would prevent all government agencies except for the Defense Department from purchasing and storing what lawmakers say is an excess amount of ammunition. The bill’s reach would include DHS and U.S. Immigration and Customs Enforcement (ICE), two agencies that have found themselves at the center of the ammo controversy. "As the public learned in a House committee hearing this week, the Department of Homeland Security has two years worth of ammo on hand and allots nearly 1,000 more rounds of ammunition for DHS officers than is used on average by our Army officers," Inhofe said. "The AMMO Act of 2013 will enforce transparency and accountability of federal agencies’ ammunition supply while also protecting law-abiding citizens access to these resources." An agency covered by the legislation would not be permitted to purchase or store more ammunition than that agency retained on average between 2001 and 2009, according to an advance copy of the legislation provided to the Free Beacon. The U.S. government is purchasing and storing millions of bullets while average Americans experience widespread shortages and soaring costs, Lucas said. "After hearing from my constituents about the shortage of ammunition in Oklahoma and the Department of Homeland Security’s profligate purchases of ammunition," Lucas said in a statement. "We have introduced the AMMO Act of 2013 to curtail these purchases so Americans can exercise their Second Amendment rights without being encumbered by the federal government." DHS officials defended the department’s ammunition purchases during a House hearing on Thursday. They maintained that the department’s stockpile of 247 million rounds of ammo is necessary and does not constitute "hoarding," as critics have argued. Nick Nayak, DHS’s chief procurement officer, told lawmakers that the department reserves the right to purchase 750 million rounds of ammunition over the next five years. DHS has already purchased around 41 million rounds of ammunition this year alone, according to Nayak. Approximately $37 million in taxpayer dollars will be spent on ammunition purchases in the entirety of fiscal year 2013. It’s "simply not true" that DHS is stockpiling ammunition, Nayak said in response to pointed questions from lawmakers. Lucas said he was startled to learn that DHS can purchase up to 750 million rounds over ammo over the next several years. "I was surprised to find out the DHS has the right to buy up to 750 million rounds of ammunition over the next five years, while it already has two years worth of ammo already," Lucas said. "This is an issue that must be addressed, and I am pleased this legislation provides us the opportunity to do so." The AMMO Act would also compel the Government Accountability Office (GAO) to audit federal agencies purchases of ammunition. "The Comptroller General of the United States shall submit to Congress a report regarding the purchasing of ammunition by agencies, which shall include an assessment of the effect of the purchasing of ammunition by agencies on the supply of ammunition available to the public," the legislation states. This entry was posted in National Security and tagged Congress, Guns, Jim Inhofe. Bookmark the permalink.